The How was Life? Global Well-Being Since 1820 report was published in October 2014. To celebrate the publication of this important report and to present it to the world, two launches were organised: one by the OECD in Paris, and one by Clio Infra in Utrecht. An impression of these two events can be found below. •	the OECD Better Life initiative: In the Better Life initiative, the OECD focuses on people's well-being and societal progress, by not only looking at the functioning of the economic system but also at the diverse experiences and living conditions of people and households. •	The Clio Infra project: Clio Infra is a global network of economic historians who, inspired by Angus Maddison (an economic historian who collected and published data on historical global GDP), collect data on the different facets of the evolution of the world economy from 1500 to 2010. The OECD and Clio Infra worked together to present state of the art estimates on the development of various indicators of well-being from 1820 onwards. The volume represents an important contribution to the discussion about broadening the concept of welfare used to understand socio-economic development (generally GDP per capita) and thereby illustrates the importance of measuring well-being ‘beyond GDP’. More information and the PDF version of How was Life? Global Well-Being Since 1820 can be found on the following page: http://www.oecd.org/std/how-was-life-9789264214262-en.htm. The data underlying the report can be found on the following page: datasets. 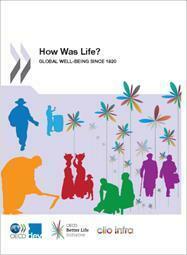 On the 2nd of October, 2014, the OECD organised the first launch of the “How was Life? Global Well-Being Since 1820” report in Paris. In a large auditorium, filled with experts from the OECD and journalist from many different countries, Martine Durand (Chief Statistician) and Mario Pezzini (Director of the Development Centre) started by introducing the project. Next, Jan Luiten van Zanden (Professor of Social and Economic history at Utrecht University and leader of the Clio Infra project) presented the main findings of the report which was followed by a comment and food for thought by Guido Alfani (Bocconi University) discussed the report. Lastly, Conal Smith (OECD Statistics Directorate) demonstrated a data visualisation tool. The Q&A session afterwards highlighted the diversity of journalists in the room and the wide international interest in the report. As can be imagined, some of the journalists were particularly interested in the performance of their own country, also in comparison to other countries and regions. These types of questions are not easily addressed without consulting the data direct and therefore highlighted the importance and potential of the publication of not only the report, but also of the underlying datasets. Because all data on the various indicators of well-being available on the Clio Infra website, it is possible for any interested party to answer their specific questions regarding a specific indicator, region or time, and make comparisons across time and space. On October 23rd, 2014, a launch was organised in Utrecht by the Clio Infra project. During the launch, Jan Luiten van Zanden presented a general overview of the report, stressing the interesting results that came from it. A further two chapters were also presented: the 12th chapter ‘Gender inequality since 1820’ presented by Sarah Carmichael and Selin Dilli, and Chapter 13, ‘A composite view of well-being since 1820’ by Auke Rijpma. The composite measure of well-being brings together the various indicators used throughout the volume to explore how they behave in conjunction. Auke highlighted that focusing on single measures of well-being misses overall progress made across multiple dimensions. Ingrid Robeyns, Professor of Ethics of Institutions, reflected on the importance of the results of the report and highlighted areas where future work might be valuable. 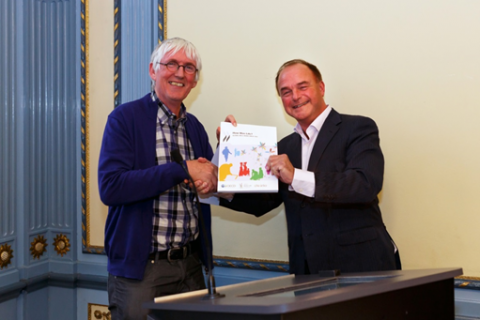 Finally, the first copy of the report was officially presented to Keimpe Algra, Professor of the History of Philosophy and Vice-Dean of the Faculty of Humanities of Utrecht University by prof. Van Zanden (see photo). On 2 October 2014, the OECD, the OECD Development Centre, and CLIO-INFRA will be launching “How was Life? Global Well-Being Since 1820”, a report that presents the first systematic evidence on long-term trends in global well-being since 1820 for 25 major countries and 8 regions in the world. This report not only shows the data but also discusses the underlying sources and their limitations, pays attention to country averages and inequality, and pinpoints avenues for further research. How was life in 1820, and how has it improved since then? What are the long-term trends in global well-being? Views on social progress since the Industrial Revolution are largely based on historical national accounting in the tradition of Kuznets and Maddison. But trends in real GDP per capita may not fully reflect changes in other dimensions of well-being such as life expectancy, education, personal security or gender inequality. Looking at these indicators usually reveals a more equal world than the picture given by incomes alone, but has this always been the case? The new report How Was Life? aims to fill this gap. It presents the first systematic evidence on long-term trends in global well-being since 1820 for 25 major countries and 8 regions in the world covering more than 80% of the world’s population. It not only shows the data but also discusses the underlying sources and their limitations, pays attention to country averages and inequality, and pinpoints avenues for further research. The How Was Life? report is the product of collaboration between the OECD, the OECD Development Centre and the CLIO-INFRA project. It represents the culmination of work by a group of economic historians to systematically chart long-term changes in the dimensions of global well-being and inequality, making use of the most recent research carried out within the discipline. The historical evidence reviewed in the report is organised around 10 different dimensions of well-being that mirror those used by the OECD in its well-being report How’s Life? (www.oecd.org/howslife), and draw on the best sources and expertise currently available for historical perspectives in this field. These dimensions are: per capita GDP, real wages, educational attainment, life expectancy, height, personal security, political institutions, environmental quality, income inequality and gender inequality. For more information and the full report, please have a look at the OECD website. Overview of datasets used in "Global Well-Being Since 1820"
The CGEH Working Paper series aims to make the most recent work on a variety of economic and social historical topics by scholars from the Utrecht group of Social and Economic History available to the public. The series also include invited or submitted contributions from colleagues and friends around the world. The International Institute for Social History will organize the Tenth European Social Science History conference in Vienna, 23-26 April 2014. The XVIIth World Economic History Congress will be held in Kyoto, 3-7 August 2015. On December 12-13, 2013, a workshop of Clio Infra and the OECD on Quality of Life will be held at the offices of the OECD in Paris. Real wages are a critical measure for human well-being. In recent years much progress has been made in making real wages comparable over time and space. Calculating real wages based on 'bare bones' and 'respectability' baskets, as pioneered by Bob Allen, has now become a widely used methodology. The studies that have appeared now allow us to compare living standards in Europe, Turkey, China, Japan, India, the Americas, and various African colonies. These studies have important implications for the big debates on the Great Divergence between Europe and Asia, and the long-term economic effects of colonialism in Africa and the Americas. Nonetheless, the use of real wages to make statements about the standard of living and economic development in past societies has also been criticized. Critics have pointed, for example, to issues regarding the representativeness of wage labour, the underlying dynamics of the labour market, and the role of female labour. In this workshop, experts working with wage and price data across the globe were brought together. New results were presented and methodological issues as well as the broader implications and possibilities of this type of research for the field of economic history were discussed.